Bendroflumethiazide 2.5 mg 168 tabl. Bendroflumethiazide 2.5 mg 84 tabl. Bendroflumethiazide 5 mg 168 tabl. Bendroflumethiazide 5 mg 84 tabl. Bendroflumethiazide is a diuretic, a drug that promotes the excretion of urine. Bendroflumethiazide is prescribed for high blood pressure (hypertension), (possibly in combination with an antihypertensive drug) or edema. Bendroflumethiazide should be taken at a fixed time. It is best to do this in the morning: this prevents that you would often need to go to the bathroom at night. 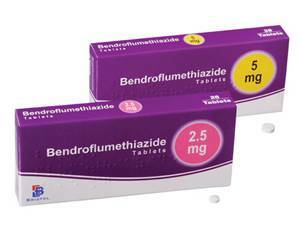 Bendroflumethiazide is available in tablets of 2.5 and 5mg. Your doctor will decide which strength is right for you. The usual dose is one tablet per day, unless your doctor tells you otherwise. If you forget to take a dose, you can still take this until late afternoon. After this time, it is better to skip the missed dose (see leaflet). Warn a doctor when you overdose. You can find an overview of (other) side effects in the leaflet. Talk to your doctor if you experience severe side effects, or if you get symptoms that are not listed in the leaflet. Please see the leaflet for a complete list of contraindications. Talk to your doctor about using Bendroflumethiazide if you suffer from any other disease or disorder. Bendroflumethiazide may endanger the health of a (unborn) baby. Do not use this medication if you are pregnant or want to become pregnant, or are breastfeeding, unless your doctor tells you otherwise. Talk to your doctor or pharmacist if you are taking any of these drugs or other medications. Bendroflumethiazide lowers your blood pressure which may cause dizziness early in the treatment.Once you are no longer dizzy, you can participate in traffic again. Alcohol may cause dizziness in combination with Bendroflumethiazide. Be careful with the use of alcoholic beverages.